When Europeans first began to explore the globe, their greatest surprise was not the existence of the Western Hemisphere but the extent of their own technological superiority over the rest of the world. Not only were the proud Mayan, Aztec and Inca nations helpless in the face of European intruders; so were the fabled civilizations of the East: China, India, and even Islam were backward by comparison with sixteenth-century Europe. How had this happened? Why was it that although many civilizations had pursued alchemy, it led to chemistry only in Europe. How had this happened? Why was it that, for centuries, Europeans were the only ones possessed of eyeglasses, chimneys, reliable clocks, heavy cavalry, or a system of music notation? How had nations that had arisen from barbarism and the rubble of fallen Rome so greatly surpassed the rest of the world? In The Victory of Reason, Rodney Stark wrote of the dynamic influence Christian ideas had in technology and increasing standards of living for the world. Hillcrest History professor Gregg Preston also pointed this out in a recent Advanced Placement European History class. 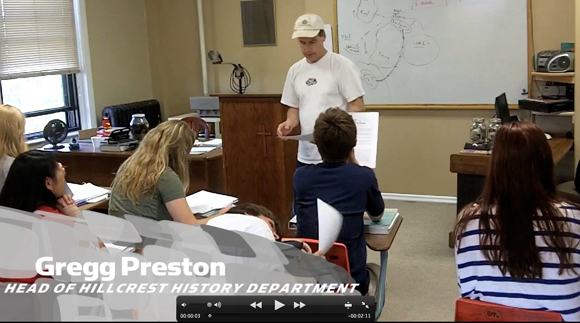 In the video above Gregg Preston remarks on how the students' text downplays the European expansion. Mr. Preston by-passes the mundane outlook of the text to draw students to the reality and excitement of this period of time. He outlines the upcoming chapter by exposing the students to the Biblical worldview possessed by much of the influential figures of the Western world. Advanced Placement is an offering at Hillcrest Academy for students to gain college credit through high school classes. The courses are outlined by the National College Board who key-in on important topics they believe the students need to know to obtain college credit. The end of the year test is administered following education in one of 5 textbooks given to school districts. Gregg Preston consistently points out biases within the text to draw students back to a Biblical understanding of the world despite the secular viewpoint of the text. Students in Mr. Preston's class truly have a solid Biblical understanding of history as they understand the secular viewpoint alongside a Biblical explanation. It's part of what makes Hillcrest education so much more than a diploma. Following the Doing The Right Thing video simulcast Saturday, a number of parents requested the opportunity to purchase the event. In what was an entertaining presentation, many parents at the event expressed a desire to show the simulcast to friends and family, commenting on how accesible the concepts were. A DVD copy was made of the event and can be purchased here: http://doingtherightthingevent.com/. Hillcrest will be conducting more parent gatherings in an effort to help parents communicate some of the Biblical truths their students are receiving in our classrooms. If you have any questions regarding our effort to help parents understand the ideas challenging their students, please email Wayne Stender (wstender@ffhillcrest.org). A steady stream of updates come from Hillcrest Academy. Whether they are 140 character snipets via Twitter, Student Life updates on Facebook, or indepth explanations on the Hillcrest website, parents are able to be aware and attentive to the culture and influences their students are participating with in the halls of HLA. An update channel that has been inplace since 2002 is the HLA Today. A student newspaper under the journalism class directed by Mr. Charlie Brue, the HLA Today staff sniff-out special interest stories occurring daily on the Hillcrest Campus. In what has traditionally been a bi-monthly production, the HLA Today is mailed to friends and family of Hillcrest Academy in paper format. Recently, the HLA Today has been made available online. Please take time to update yourself on the happenings at Hillcrest. If you would like to receive more information on how you can get a paper copy mailed to your home please email Wayne Stender (wstender@ffhillcrest.org).